One of the things I look forward to the most in Fall and Winter is the sweet potato! I love it for its taste, health benefits and versatility. I also like to add it to a meal when I’m craving more comfort and bulk. It goes down easy and adds just the right texture to make any dish a little more crave-worthy and filling. 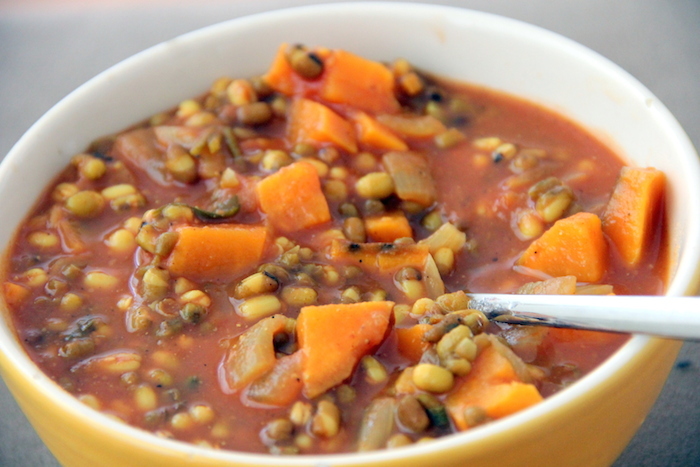 This soup is perfectly complemented by sweet potato, but it stars the one and only mung bean! These beans are new to my repertoire, but I love them in all their variations. I first was introduced to mung beans through pasta. Later, I decided to check them out in their original form, and they did not disappoint! 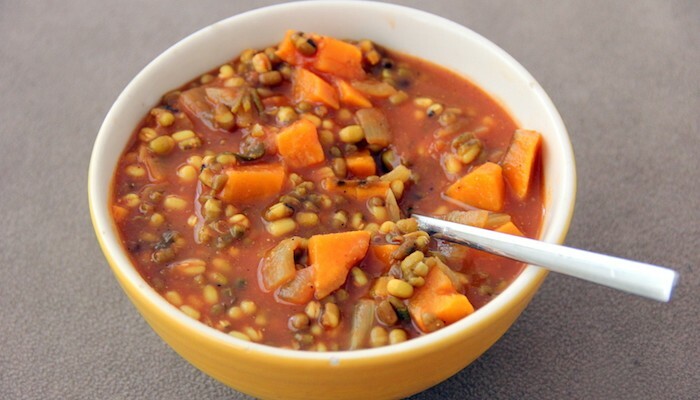 This chunky soup is a great way to enjoy mung beans and sweet potato as you console your way into colder weather. Mung bean: comes from India and has been used for thousands of years for Chinese medicinal purposes. Today, it is used in the kitchen. Mung bean is high in soluble dietary fibers and low in cholesterol. It lowers LDL (bad) cholesterol, prevents breast cancer, regulates hormones, is apt for diabetics and contains approximately 3.16 grams of protein per cup. Add all the ingredients into a pot over medium-high heat. Stir and add the water. Put on a lid. Bring to a boil and reduce heat to a simmer. 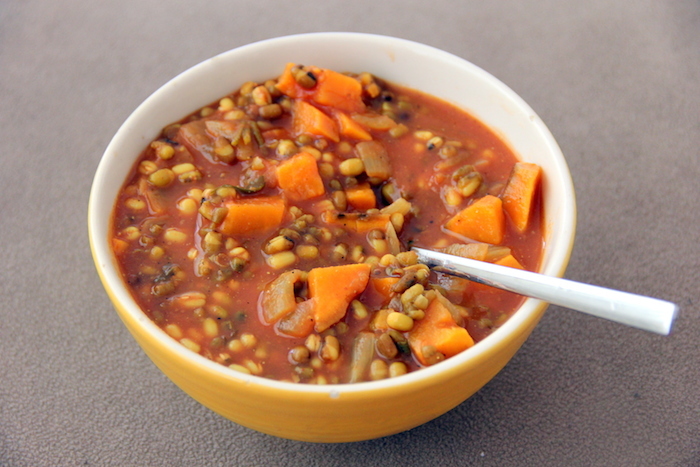 Cook for 15-20 minutes, or until the soup is rich in color and the sweet potato is soft. This entry was tagged detox recipes, easy healthy recipes, easy soup recipes, going vegan, good vegetarian recipes, great vegetarian recipes, healthy, healthy breakfast recipes, healthy dinner recipes, healthy food recipes, healthy recipes, healthy soup recipes, heart healthy recipes, how to become a vegetarian, mung bean, mung bean noodles, mung bean sprouts, mung beans, quick vegetarian recipes, simple vegetarian recipes, soup, soup recipes, soups, soups recipes, vegan, vegan essentials, vegetable soup, vegetable soup recipe, vegetable soup recipes, vegetarian, veggie recipes, what is a vegan, what is vegan. Bookmark the permalink.